With a little preparation, you can lead an engaging exercise to enable people to explore what is needed to address our climate and energy challenges. Before starting the World Energy Simulation, each person is assigned to one of six groups and given a Briefing Statement and Input Table specific to their group. These materials provide background information and context for the participants as they begin the game. En-ROADS Simulator – supporting energy and climate policy simulations for World Energy. NOTICE: En-ROADS is currently unavailable as we prepare a new version to be launched later this year. 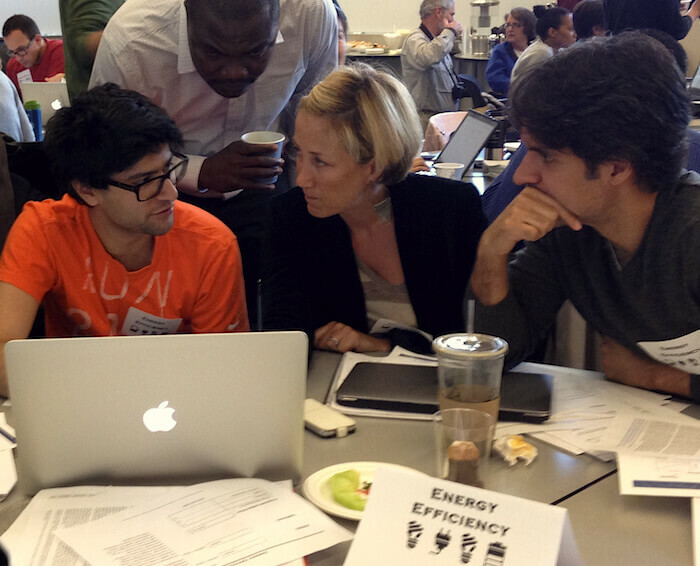 If you plan to run World Energy in the interim, please contact Yasmeen at yzahar@climateinteractive.org. World Energy Facilitation Guide – leads you through key concepts in running World Energy, from preparation and room setup to sample scripts and debrief techniques. World Energy Slides – facilitator’s slide sets containing background materials and instructions. World Energy Input Tables – form for participants to list their proposed actions. World Energy Table Cards – print and fold to indicate where each group sits. Assignment to create an optimal scenario – Use as a standalone assignment and/or to accompany World Energy. World Energy Results Worksheet – Have each group complete as they play World Energy. Translated materials of previous versions of World Energy can be found here in Deutsche, Español, and Português. March 2019 – English materials updated. September 2017 – German materials translated by Christoph Mandl. February 2016 – Spanish and Portuguese materials translated by MIT.